MANILA, Philippines – San Miguel Beermen (SMB) simply lived and died by the 3-point shots and gave the game away to Rain Or Shine (ROS). 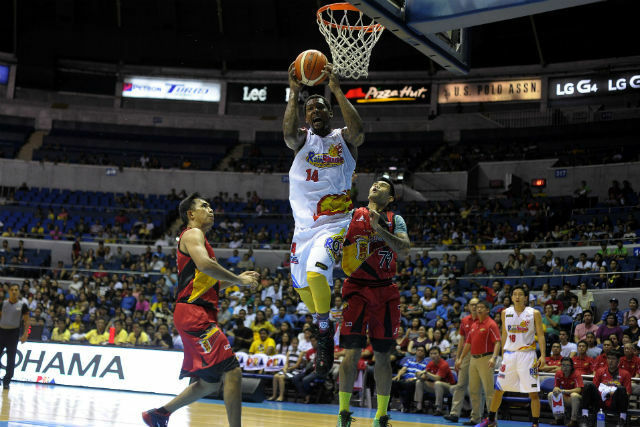 The Elasto Painters banked heavily on their monster-like import to overcome a huge Beermen lead and even the series 1-1 on July 4, 2015 at the Smart Araneta Coliseum in Cubao, Quezon City. Rain Or Shine (ROS) Head Coach Yeng Guiao was really disappointed on his team’s recent debacle against the second-seeded San Miguel Beermen (SMB). The fiery Coach had scolded his boys for blowing out their 24-point first-half lead. His assistant Coach, Caloy Garcia said in an interview that Guiao had thrown out all the foul words that anyone can imagine at his aids and players. Just like game number 1, Wendell McKines drew the first blood followed by a three by Paul Lee. Arwind Santos on the other end of the court, gave his team their own version of a three-pointer seconded by Marcio Lassiter: a glimpse of what could their game 2 be, a three-point shootout contest. Merely seconds after Santos and Lassiter launched their long bombs, their import, Arizona Reid joined the party from downtown followed by another trey from Arwind Santos. All of SMB’s first 12 points came from the rainbow territory. Speaking of 3-point shootout, the Elasto Painters missed the services of “Extra-Rice Inc. CEO” Beau Belga due to the right ankle sprained that he sustained last Wednesday. “Nothing to worry” said “Extra-Rice Inc. other half” JR Quinahan as he participated in the longshot shooting spree together with Jireh Ibanes. AZ Reid tallied his 11th point of the game via his 3rd 3-point shot in the first quarter alone. Certified 1st quarter 3-point showdown with the Beermen completing 6 out of 10 while the Elasto Painters had 3 out 9 from downtown. The opening period ended in a tie, 26-26. The Beermen shifted their focus from scoring to defense in the second quarter as Chris Lutz, Arizona Reid and Gabby Espinas denied ROS’ bigmen underneath the basket for 3 straight steals. Painters obviously felt the absence of their bruiser center Beau Belga in the front court. The Men in Red were still hot behind the arc as AZ Reid and Ronald Tubid continued to fire outside. “It is my personal mission to shoot better outside” uttered by the import in dread locks during an interview before the game ball proper had started. Wendell McKines on the other end was doing damage under the rim. McKines had a total of 18 first-half points and 6 of them came from thunderous slam dunks. After 24 minutes of exciting basketball, the Beermen were ahead by 5 points 53-48 led by AZ Reid who had 19 points and 5 out of 7 from the rainbow country. The 3-point shooting party continued as Arizona Reid and Marcio Lassiter began the 3rd period with 3 straight treys while Jeff Chan and Gabe Norwood reminded the Beermen of what they are capable of doing behind the arc. Marcio Lassiter humiliated his defender Jeff Chan twice by shooting 2 3-pointers in front of the latter’s face. Lassiter had a total of 16 points and 5 out of 7 from the outside with 6 more minutes remaining in the penultimate quarter. San Miguel entered the final 12 minutes with 89-77 lead. Lassiter’s hands were extremely burning as he recorded his 9th 3-pointers of the game with 8 more minutes remaining on the game clock. Lassiter had a career high of 10 3-pointers for a total of 31 points. While Lassiter was tearing the net by his outside shots, McKines was crashing the boards and unstoppable in the shaded lane. Wendell trimmed SMB’s ample lead to just 4 points 110-106 with 2 more minutes left in the 4th. Refused to give up, ROS import single-handedly ran the show for his team and managed to bring down their deficit to just a single-possession, 110-108. McKines had a game high of 53 humongous points and 17 rebounds and the unanimous winner of the Best Player of the Game award. Gabe Norwood made a 19-foot jumper to tie the game 110-all with 25 seconds remaining. The Elasto Painters finally grabbed the lead with big-time 3-pointer after stripping the ball from Marcio Lassiter’s hands. Coach Yeng Guiao punched the air after Chan made the game-winning basket and obviously happy with his team’s unbelievable comeback win. The Beermen had the chance to tie the game but Marcio Lassiter missed his 3-point attempt. Rain Or Shine has completely buried their horrible finish last Thursday with this epic come from behind win. They will face the Beermen in high spirit and confidence in Game 3 on Monday, July 6 at the Smart Araneta Coliseum.